JEE Main & Advanced cracking requires good understanding of the principles and concepts of physics and their applications to solve a variety of problems, regardless of the examination format. A massive collection of the most challenging problems, the Selected Problems Series consists of three books, each one for Physics, Chemistry and Mathematics, which corresponds to the practical needs of students in the upcoming JEE Main and Advanced exams. 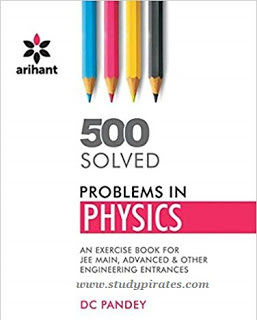 DC Pandey's, 500 Selected problems in physics aim to perfect your problem solving skills through 16 logically sequenced chapters in all aspects of the examination syllabis. You will be able to understand the basics of physics by working through these chapters and avoid the obstacles in the application of the concepts. The step - by - step solutions to the problems in the book will teach you the time - saving strategies that are essential for all those who appear in JEE Main & Advanced and all other engineering entry exams or who are inclined to solve problems in physics.